Most girls seem to go through that horse loving stage. Not surprising really because they're beautiful, graceful and majestic animals. Luckily if you know a young horse lover it becomes a lot easier to find a gift they'll love. Just think horse related. I don't know about you - but when I'm looking for a gift about a specific animal I can never find what I want. So being a horse mad child myself once I thought I'd gather some of the best ideas I could find to help out. Board games are a popular choice for girls age 7 and up. 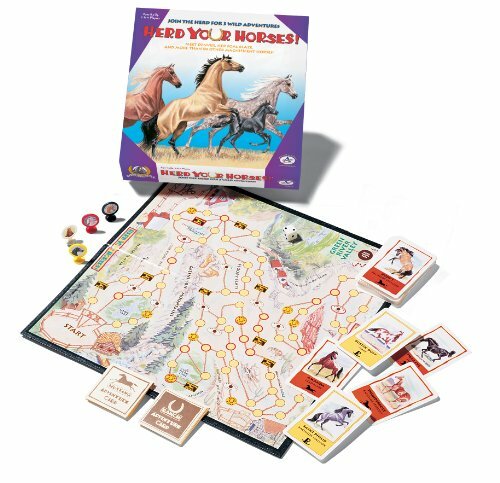 Herd Your Horses is a very popular game that lets players experience life from the horse's or the rancher's point of view. It has multiple games at different levels so children will find it fun, challenging but not too hard. 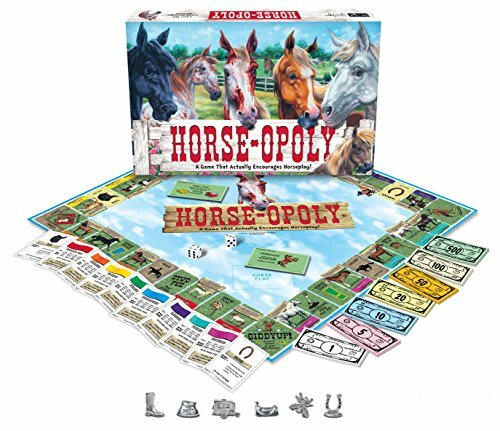 Of course Horse-Opoly is based upon the well known Monopoly board game. Both board games are fun for children and teenagers to play. So they're a gift that girls won't outgrow. These board games also make it easy to find a good gift for a teenage girl. Soft toys are a bit of a "stand-by" gift. They're something gift givers tend to grab without having to think too hard about what to buy. This means most girls will have LOTS of soft toys already. So for a soft toy to still be a good gift it has to be special. I thought the absolute cuteness of this Dream Pony let it reach this special status. This sleepy pony is hard not to cuddle up to. So even if a girl has lots of soft toys I don't think he will be neglected and left on a shelf. 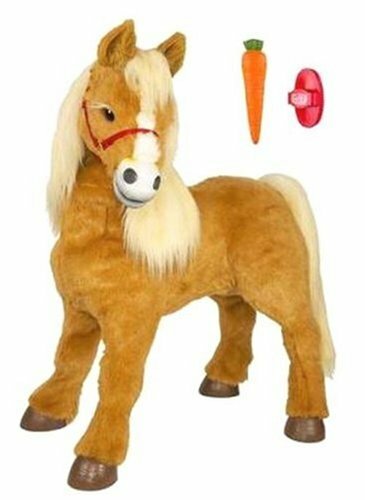 This soft toy has to be the pinnacle of all horse soft toys. Every little girl wants to own their own horse. To cuddle it, care for it and ride it. This is a toy horse that's more than 3 feet tall. It moves, swishes it's tail, responds to it's young owner and will let a child (weighing up to 80 pounds) "ride" them. But it doesn't need feeding, never needs to see a vet and doesn't need you to pay for a stable. Perfect!! So this is a great gift for a birthday or Christmas. It can give a young girl their own "horse" without all the expensive extras that go with it. 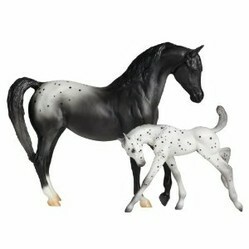 It's a fun toy for pretend play that lets them imagine loving and caring for their own horse. 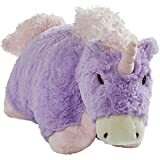 My Pillow Pets Lavender Unicorn 18"
Here's another Pillow Pet that's well matched to children's interests (well obsessions). This horse pillow pet is cute and cuddly. It's a lovely gift for a girl who loves horses. As well as the brown horse Pillow Pets also has a lavender unicorn. 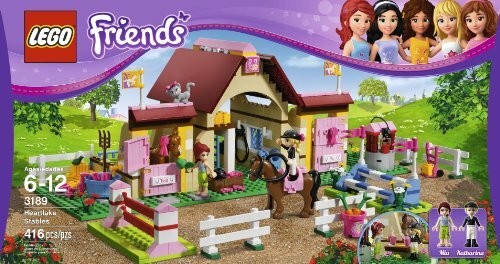 This also makes a great gift for girls who love horses. The unicorn gives a magical twist to the horse gift theme. It's also a fun way to give a horse gift that isn't the usual brown that's seen in horse toys and gifts. The lavender is a lovely sweet color that's very soothing and nice to cuddle up to. 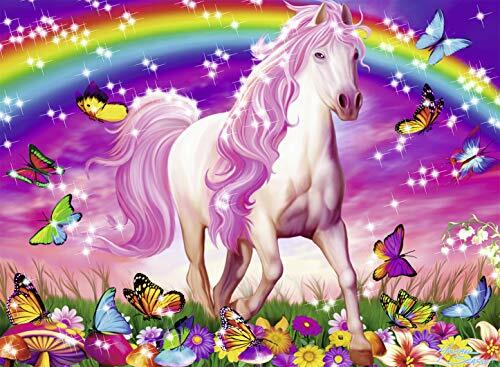 It's also a magical color, because there aren't many purple or especially lavender animals. So it makes this horse really special. Horse play sets are a good idea. Preschool and young school age kids love to pretend play with them. Older girls love to collect them. 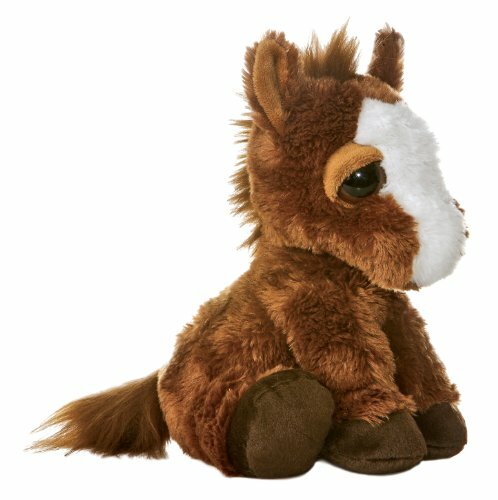 There're also a novel idea for a gift for a girl who loves horses that's different to the soft toys that are usually given. These horse sets aren't good for very young children though. They aren't dangerous but they won't last very long if they're given to a 2 or 3 year old. Children from about 4 should be able to play well with them without breaking them. 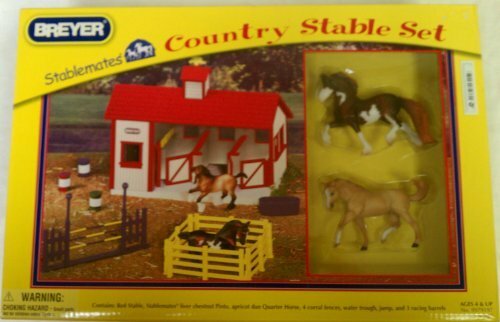 As well as horse gifts don't forget about stable themed toys. Getting the whole stable rather than a few horses really encourages pretend play. Girls can act out lots of stories when they have a stable. This helps their creativity and imagination. It's also heaps more fun and will keep them busy and happy for much longer. The hobby horse is a lovely traditional toy that younger girls still love today. They're great for pretend play so prefect for older toddlers and preschool children. Girls shouldn't grow out of this toy until they're about 8 so it will be played with for years. This lovely hobby horse caught my eye for a few reasons. It's soft and in girly colors with sweet purple reins and pink flowers. The horse is also cute looking. One of the most important things about this hobby horse though is that it makes sounds. 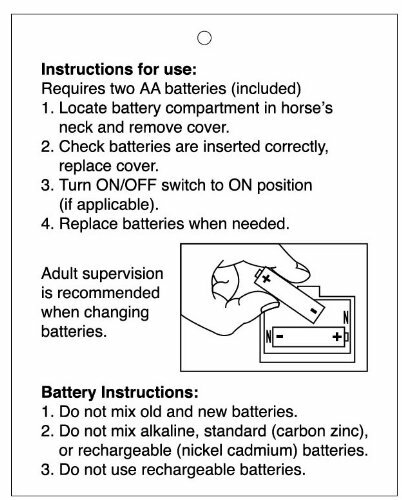 If you squeeze the left ear you get clipperty clop and whinny sounds. When you squeeze the right ear you get a musical chime sound. This makes it much more fun for young girls. Preschool and school age girls love craft kits. So luckily there's a few that are horse related. If you know what sort of craft activities the girl you're buying for likes (e.g. sewing, painting, stickers) you won't have any problems getting a gift she'll like. Just find a horse craft activity that focuses on what she enjoys doing (Amazon has a wide choice). When you buy a craft kit as a gift it's a good idea to also check the recommended age range. If the craft is made for older girls the child you're buying for might find it frustrating and hard (or just plain boring). If it's made for a younger girl it will seem baby-ish to the child you're buying for. This is also something you'll want to avoid. So age recommendations are useful. Puzzles are a fun idea for a gift. There're aren't many horse puzzles around though. Amazon has a few. But these are for school age girls. They would be too hard for a toddler or preschool child to play with. If you're buying for a toddler or preschool girl who loves horses have a look a the farmyard themed puzzles for little kids. These often have a horse in them. I've picked two of my favorite horse puzzles for girls but you can find a few others on the Amazon site too. A topic children love, like horses, can encourage them to enjoy reading. This is because reading about something you love makes it more interesting and fun for kids (and adults too of course). 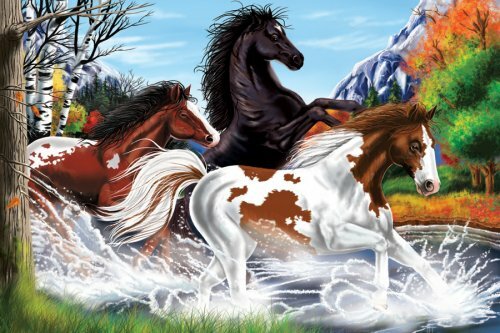 Amazon has heaps of books about horses that are good for girls from toddler age up to teenagers. 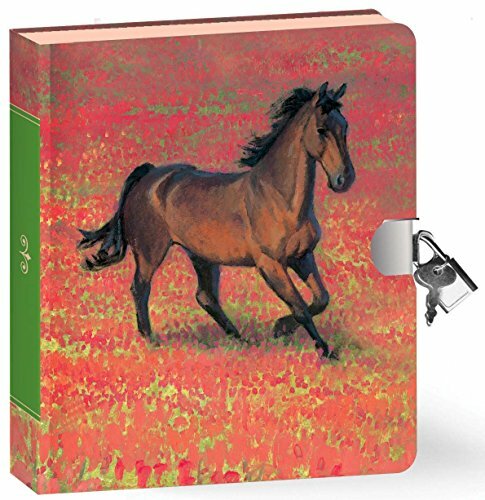 There's picture books, chapter books, fact books, puzzle books - all about horses. Books are also good because they come in a really big price range. You can get great books from a few dollars up. There's also lots of different styles so you can get books full of horse information, to mysteries, adventure stories or just cute stories for little kids. When you're looking for books don't forget about early readers for children who are learning to read. There's some lovely horse books in that range and they sell for only $3 - $4 each usually. Amazon has these early reader books in stock. Other nice gift ideas that girls will love include things like a diary (one that locks of course to keep secrets safe and younger siblings out). 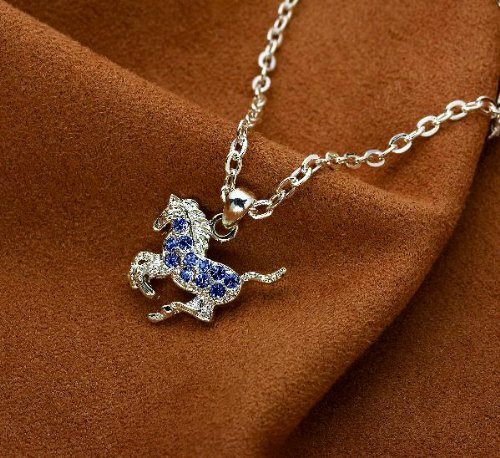 There's also some lovely jewelry with horses at Amazon. 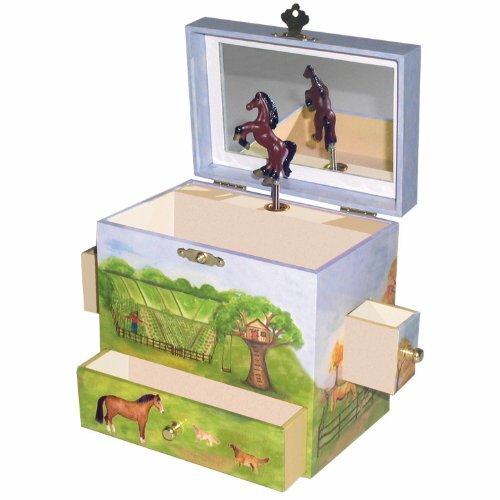 Classic music boxes are also made with twirling horses instead of ballerinas. These all make great Christmas gifts for girls who love horses.